Some seriously disturbing images by Chris Jordan. 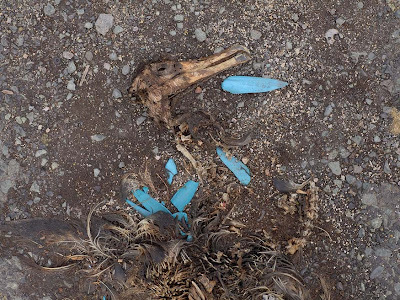 Jordan the photographer who is constantly reminding us of just how much we consume has turned his lens towards the carcasses of albatross chicks on Midway Island. 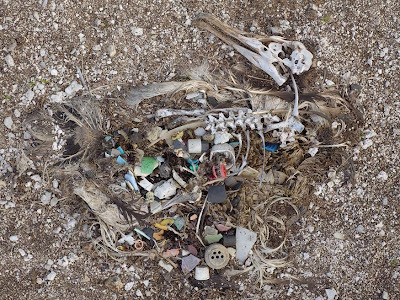 Apparently the mothers feed the baby chicks pieces of plastic because they look like food, and because the ocean is full of floating plastic bits. 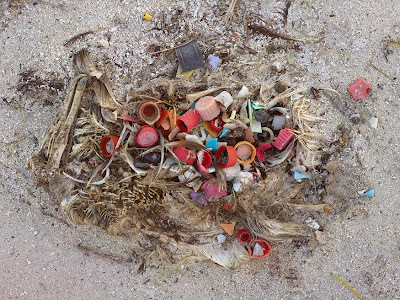 One way we can stop this tragedy is to completely stop buying plastic bottles and such and if you re already on that page then we can do what Rodrigo McCoubrey of Rodrigo's Recycled Art does with refuse. I've been a big fan of his work ever since I saw it in the Surfers Journal (Vol.15 #1) awhile back. Rodrigo makes funky sculptures out of trash. Seems that if every community, every school, college, and art institution did what he does a few times a year we could reduce the amount of plastic in the ocean, create some cool crafts, and at the same time raise funds for the arts and education.